Sumo, like many organisations, has its different categories of people. First and foremost are the wrestlers. They take centre stage and represent sumo's true image. What makes sumo news is the wrestlers’ tournament results, their rankings and their injuries. Everything revolves around them. In short, they are sumo. Then there are the management staff; those who ‘pull the strings’: the Japan Sumo Association (Nihon Sumo Kyokai). Further from the public eye, these executives sometimes make statements to the press and they don't miss an opportunity to fuel an ongoing scandal from time to time. Finally there are those who one might describe as working ‘behind the scenes’: all of those who are never interviewed; who never get talked about, but whose existence and whose contributions to sumo are critical for its smooth running. It is these people, of whose existence everyone knows, but whom no-one really knows much about, that we have decided to spotlight in a series of articles focusing on each of these ‘sumo trades’. We dedicated the first chapter of this series to the tokoyama, who act as hairdressers to the rikishi (See Le Monde du Sumo Issue 20, February 2007). 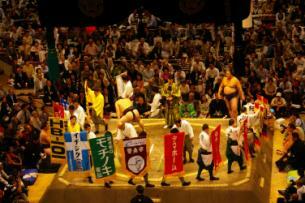 Today we are planning to find out about some of the men that one sees at sumo bouts. They are everywhere, they do a wide variety of jobs and they are very important to the running of the bouts. These true ‘jacks-of-all-trades’ are the yobidashi. Some of the information presented in this article comes from our interview with yobidashi Kokichi. These two documents are complementary, in the sense that each one contains original elements, so we strongly recommend that you read the lot! Sumo isn't characterised by the exuberance of its personnel. They do their jobs, but they always have to take care not to draw attention to themselves, because the good of the community is what matters. This rule is clear, above all for the rikishi who form sumo’s ‘shop window’; suffice it to say that, with some rare exceptions, they apply it quite well. But the prize for discretion definitely goes to the men behind the scenes, who we always see in action but never really notice. The complete list of all the tasks of these omnipresent workers would be hard to draw up, so extensive is their domain. All of it done, of course, without making any more noise than is necessary. One word sums up all of that: yobidashi. Just like the tokoyama, the yobidashi are an integral part of the world of professional sumo. Plus, as members of the Nihon Sumo Kyokai, the Japan Sumo Association, they are subject to the age limit, fixed for everyone at 65. At present there are 40 of them, with an upper limit of 45, and each of them is associated with a sumo stable. The distribution is, however, unequal, first of all because there are more stables (52) than yobidashi, which means that some stables don't have any at all, but also because some of the heya have several (up to three currently for Kiriyama Beya and Otake Beya). However, this distribution isn't important because, where necessary, the yobidashi are willingly shared within the same ichimon (a sort of grouping of stables), and sometimes even between different ichimon. Within the association everybody is ranked. The rikishi of course are those whose position within the hierarchy is most talked about. But the yobidashi are also subject to a ranking scheme. Their ranking, as it is with the wrestlers, uses the principle of divisions. Moreover, they are calculated in just the same way. One finds the yobidashi in the following positions, in increasing order of importance: jonokuchi, jonidan, sandanme, makushita, juryo and makuuchi. The same as the divisions found in professional sumo (See Le Monde du Sumo Issue 1, December 2003 for further explanations about these divisions). In addition to these grades there are three further levels which are higher still. The first of these ranks is called sanyaku, also just like for the rikishi. The two highest rankings are related to the yokozuna. The holders of these ranks are called the fuku tate yobidashi and the tate yobidashi, the latter being the ultimate rank that can be attained. In order to push this analogy still further, one can even see on the banzuke (the official rankings sheet for all the wrestlers, brought up to date after every tournament - see Le Monde du Sumo Issue 6, October 2004 for a detailed explanation) that some names, among the thousands of small ones that feature there, are those of the yobidashi considered to be like sekitori (ranked juryo or above). But if the rankings and their representation are done according to the same model as the rikishi, the method of progressing up the rankings turns out to be less complicated, and works on a system of seniority like that we have already described for the tokoyama. It isn't only about age certainly, because technique also plays an important part at promotion time, but when you look at it closely, it is with the passing of years that one perfects one’s gestures and one’s attitudes, and as a result gains experience. One thing that is certain is that the tate yobidashi and the fuku tate yobidashi are close to, or perhaps have even achieved, excellence. As we have mentioned above, it would be specious to attempt to draw up a complete list of the yobidashi’s responsibilities. One of the most important is one that doesn't particularly bring them into the public eye, because it takes place away from the tournaments. To be more precise it happens just before the tournament, because it is in fact the construction of the dohyo, the area on which the rikishi fight. So one can see why it is of critical importance: without the dohyo there would be no sumo. But more importantly, a badly constructed dohyo could turn out to be very dangerous for the wrestlers who could hurt themselves seriously in a fall if the surface was too hard or too soft. Without going into detail of the correct construction of the dohyo, it should be noted that this work requires the participation of almost all of the yobidashi who for three days work at producing something as close as possible to the perfect combat surface. It all takes place under the supervision of the most experienced yobidashi, who knows exactly what quantity of water to mix with the earth in order to obtain a dohyo which is capable of standing 15 days of intense and repeated stress. Less resource-hungry is the building of a training dohyo present in each stable, which also falls to them. In practice, this construction is usually done with the help of the rikishi in the heya, wielding spades and wheelbarrows, but the job is always overseen by one or more yobidashi from the heya or the ichimon. Apart from this building work which comes up between tournaments it is mainly during the honbasho (official tournaments) that the yobidashi's timetable is the busiest. On the day before the first combats, a small group walks up and down the streets of the host city to inform the locals of the start of the tournament. It is difficult to miss them when they pass your windows, because these yobidashi walk along to the sound of the taiko, a sort of drum. This drum reappears every morning, shortly before the combat begins, to invite the public to attend the competition. This time, this particular sound is not heard in the streets, but in front of the entrance to the gymnasium, at the top of a bamboo tower (yagura) 16 m high, where two yobidashi are positioned. This performance of yagura-daiko is repeated at the end of the day, after the final combat, to request the departing visitors to come back on the following day. Inside, everything now takes place around and on the dohyo. While the rikishi, who know the running order, are still in the shitaku-beya (changing room) waiting their turn, a yobidashi tells them when it is time to enter the arena. This communication is done by means of a hyoshigi, an instrument made of two pieces of wood joined by a cord. Banged one against the other, these pieces of cherry wood emit a very clear sound, which indicates to the next two competitors that it is time to come and sit ring-side. When a bout is finished and the two participants have bowed and descended from the arena, the following confrontation gets under way immediately. Once again it is a yobidashi who gives the signal, presenting the two wrestlers who are going to face each other. The order in which they are announced doesn't depend on their ranking, but merely on the tournament day: on odd days (first day, third day etc. ), the combatant on the east is called first. On even days, it is the other way round. This announcement is definitely the moment when a yobidashi is most exposed to public scrutiny; moreover the term ‘yobidashi’ means ‘herald’. He always enters the dohyo from the south (side marked 1), to the left of the gyoji (referee) on odd days and to his right on even days. He goes toward the centre (marked 2), then turns towards the first fighter that he is going to announce. He moves one or two steps towards him, opening his paper fan. He stops when he gets to the white line painted on the ground (marked 3) and pronounces the introductory phrase in a chant, lengthening certain vowels exaggeratedly “higashi, Takamisakari, Takamisakari”, that is “from the east, Takamisakari, Takamisakari”. He then turns, moves towards the other white line (marked 4) and, in the same tone, presents the second rikishi “nishi, Asashoryu, Asashoryu”. That is “from the west, Asashoryu, Asashoryu” (this is of course only one example of a combat taking place on an odd day, where the wrestler named Takamisakari presents himself on the east side to face Asashoryu on the west). All of the yobidashi follow each other in succession onto the dohyo to make these presentations each day of the basho. Their order of appearance depends, like so many things in sumo, on their ranking; so the youngest ones shoulder arms in the lower divisions and as they grow more experienced, they climb up the grades towards the higher divisions. During the rikishi's preparation phase, the yobidashi continue to be busy. Some bouts in makuuchi division have prizes awarded to the winner. Usually, such bonuses are found when at least one of the wrestlers is very popular with the public, whether due to his strength or just whimsy. In fact, the sponsors of these prizes benefit from low-cost publicity (a few hundred euro) with banners in their colours. At this point the yobidashi intervene once again, and, like a train of sandwich boards, each grab a banner at (1), climb on to the dohyo and, in single file, show them to the crowd while going round the sacred circle, then dismount at the other side (2). There are rarely more than about 10 kensho-kin (or kensho, as these bonuses are known) placed on a single combat. However, the overflow of enthusiasm from the patrons can sometimes cause logistical problems. Knowing that one man can only carry one banner at a time and that only a limited number of yobidashi can be assigned to this task at a time, it sometimes happens that one or more of the bearers makes one circuit, puts down their banner as they descend from the dohyo, runs back to the starting point to take a new banner and sets off again. With a record of more than 50 kensho-kin on a single bout, it is useless to guess the breaking point! (See Le Monde du Sumo Issue 16, June 2006 for more explanations about kensho). For all the time before the combat starts, while the wrestlers are getting ready physically and mentally, the yobidashi get on with their work. Those who weren't involved with presenting the kensho are busy with maintenance of the dohyo, whose surface is covered with a fine layer of sand. So as to give the fighters the smoothest surface possible, they use brooms to make sure the sand is well distributed. Outside the sacred circle an even layer of sand makes it possible to see the slightest toe print, an indication of defeat, and so this is also touched up. This maintenance is done before every bout and is supplemented by more thorough maintenance at various stages in the tournament day. Namely, between the bouts of two different divisions, at the mid-session interval “nakairi” in makuuchi division when the shimpan (judges) are replaced and finally just before the last three bouts of the day. For this thorough cleaning, a yobidashi sprinkles a small amount of water with a watering can all over the dohyo surface and then a methodical circular sweeping is carried out. Finally, to make sure they are clearly visible, the shikiri-sen (starting lines, painted white) are cleared of all dust. Continuing with maintenance tasks associated with the bouts, the yobidashi are also responsible for providing water (chikara-mizu, with which the wrestlers from the two highest divisions rinse their mouths), paper (chikara-gami, behind which they hide to spit out the water) and salt (thrown on the dohyo to purify it). Also, as the containers for these items are placed at the south east and south west corners of the dohyo, a yobidashi is placed at each of these points to ensure the safety of the rikishi. It isn't that unusual for a combat to end on the laps of the spectators in the front rows and these yobidashi are charged with nimbly withdrawing the water bucket (mizuoke) should the rikishi, carried by their momentum, look likely to fall on it, in order to make sure that they don't get hurt. They are allowed to sit down on a little stool, but have to stay alert and ready to jump up if necessary, to move the dangerous containers. You might also notice yobidashi helping the shimpan (the 5 judges sitting around the dohyo), particularly when they sit down at their observation posts: so that they don't get sand sprayed over them, a cover is folded over their legs. It is up to a yobidashi to take care that these famous spectators hardly have to move to be covered by their protection. As well as covers, the yobidashi set down (and withdraw) the large cushions that the sekitori sit on around the dohyo while waiting for their fight. More precisely, they interact with the sekitori’s tsukebito (assistants), who carry the cushions from the changing rooms to the end of the passageway leading to the dohyo, then hand them to the yobidashi who put them down below the dohyo before the rikishi enters the arena. Immediately after the bout, the yobidashi frees up the position by removing the cushions and carrying them to the tsukebito who take them back to the changing rooms. 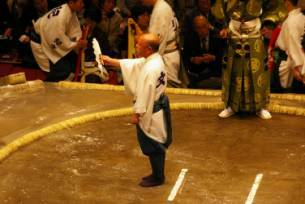 When a bout is over and the winner has been determined, if any kensho have been placed on the bout, a yobidashi climbs up on to the dohyo and hands over the pile of envelopes containing the prizes to the gyoji. The gyoji is responsible for solemnly handing them straight over to the winning rikishi. All of this ritual is repeated every day unchangingly throughout the tournament. At the end of the day, scarcely have the final bout and the bow dance finished when the yobidashi are already preparing the dohyo for the following day by meticulous sweeping of the surface and removal of excess sand and other impurities. Afterwards, the shikiri-sen are repainted, then the whole dohyo is covered with a tarpaulin. Before this, the yobidashi will have taken care to put in place an ingenious system to allow the wet paint to dry without sticking to the cover. A stool (similar to the one on which the water bucket attendant sat) is placed between the two lines, and two square tatami are placed against this “pillar of fortune”, thus creating the slopes of a sort of tent. 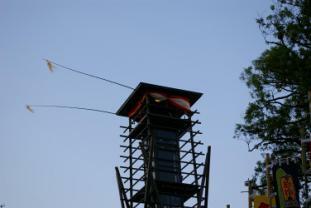 Once the device is in place, the cover is unrolled and the dohyo is ready to receive the hardest of shocks the next day. One thing for certain is that the yobidashi are always in action, so they need clothing that will not impede their movements. Moreover, as members of the Nihon Sumo Kyokai, in the public gaze what's more, a uniform is required. On their feet they wear tabi, a sort of sock with a rubber sole. Some of them just wear tabi, others wear sandals over the top. Their trousers are a hakama, puffed out down to the knees and tight-fitting around the ankles. The name of a yokozuna or of an ozeki is often written on the back, and is a sign that the clothing was a gift on the occasion of a promotion to a higher grade. A kimono completes the look. Here also, there are inscriptions on the sleeves and on the back: the names of sponsors, nine in total. A yobidashi is thus equipped with a wardrobe of nine different kimonos, each of which he must wear at least once during a tournament. As for the tools of their trade, they have already been mentioned previously. A paper fan for the presentation of the rikishi, a hyoshigi made of two pieces of wood tied by a cord and not forgetting the taiko drum and of course the brooms and watering cans necessary to dohyo maintenance. After you have read these pages we are sure that yobidashi will appear in a new light … and just as invisible! We would like to give enormous thanks to yobidashi Kokichi and to Harumi Hotta for their valuable collaboration in producing this article! Table listing shikona, name, rank, and heya affiliation for all yobidashi as of the 2007 Kyushu Basho. Photos of yobidashi at work.